Matting which scrapes off dirt on your door step is important, it keeps flooring indoors cleaner and reduces the risk of slip hazards. 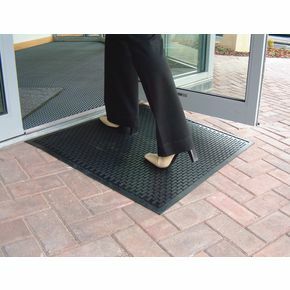 Our surface scrape mats can help to achieve this, when placed at an entrance it will prevent dirt from being brought into your premises. The raised surface provides an excellent scrape action to remove soil and debris off footwear. They offer great slip resistance, whether in wet, greasy or oily conditions, providing safety for the users and it makes them suitable for many applications. Ideal for indoor or outdoor use they suit medium to heavy duty use areas, as an industrial mat or as a catering/food industry mat, as well as just as a standard entrance mat. They work to contain dirt, grit and water, holding up to 2.6 litres water/m² or 1.5kg of dry dust/m². They are machine washable making them easy to clean as they are made from 100% Nitrile. Being supplied with safety bevelled edges makes them safer and less of a trip hazard. There are four sizes to choose from - W x L mm; 850 x 750, 850 x 1400, 850 x 3000 or 1100 x 1700. Our surface scrape mat provides an excellent way to stop dirt in its tracks at the entrance or in other areas of a building. They come with a 12 month guarantee and FREE UK Delivery.